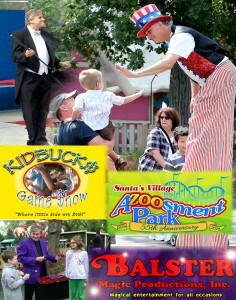 Tim Balster’s Sheer Magic now Playing at Santa’s Village! Don’t miss the master magician Tim Balster at Santa’s Village. Come see what new tricks are up Tim’s sleeve for this year’s amazing version of Balster’s Sheer Magic on the magic stage at 3:30 weekdays and 4:30 weekends. Catch the down home country fun of Tim Balster’s Kidbucks Gameshow, “Where Little Kids Win Big” everyday at 1:00 pm weekdays and 2:00 pm Weekends & holidays at the Evergreen Theater.